What seeds will I start indoors this year? Not even a year ago, that was the furthest thought from my mind. When I started work in communications at Seed Savers Exchange in November 2016, I thought indoor seed starting was the domain of master gardeners and others with a green thumb. In other words, it was not for me, someone who struggled to keep even the hardiest house plants alive. Heidi Hackman shares soil with a young attendee of the 2017 "Start with a Seed" workshop. The 2018 workshop will be held March 3 at Heritage Farm in Decorah. Do make sure the timing is right for starting seeds indoors by checking the average last frost date in your area. Seed packets typically offer guidelines about when to start seeds indoors as well as information such as days to germination and maturity. Don’t get too hung up on the containers in which you will plant your seeds. Many different items will work as containers, including many you might have already in your home—think yogurt cups, egg cartons, and even egg shells. Just make sure that there are holes in the bottom of your containers to allow for water drainage. Do make sure you have good soil. Add 30-40 percent compost (i.e., nutrients) to your seed-starting soil mix. The mix should be damp (not wet) before you plant your seeds. 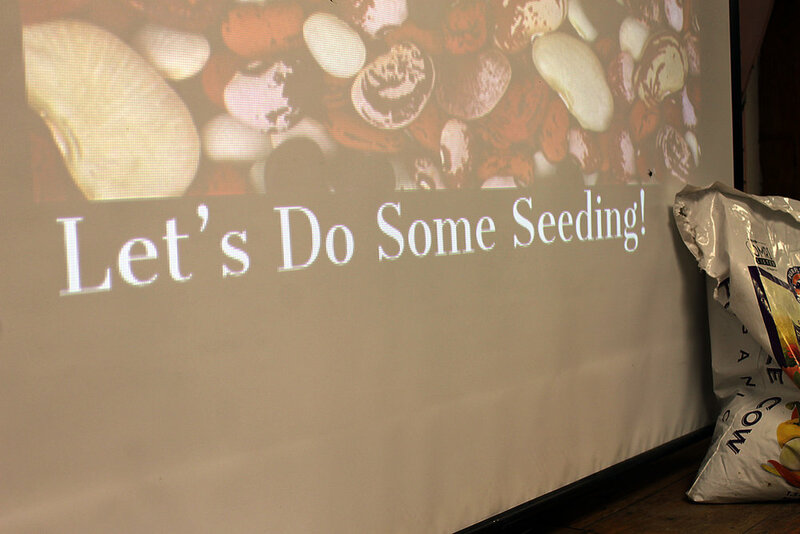 Do follow the directions on the seed packet when it comes to planting depth. Planting seeds too deep is a leading cause of low germination rates. Do cover your containers—plastic wrap will do!—until the seedlings emerge to help ensure a more constant moisture level. Make sure to remove the cover as soon as you see the seedlings. Do strive for optimal germination temperature (optimal growing temperature plus 10 degrees for most plants) for your soil by placing your containers on heat mats or even on top of your refrigerator. Remove your containers from heat once your seedlings appear. Do place grow lights (if you use them) close to the soil once seedlings emerge. Do consult trustworthy online resources like this growing guide from Seed Savers Exchange for more information. The 'Italian Heirloom' tomato is one of dozens of open-pollinated tomato varieties sold by Seed Savers Exchange. Armed with these tips, I was determined to start plants from seeds for the very first time. What plants? Tomatoes, of course—a tried-and-true beginner’s crop. But what variety of tomatoes? That proved a tougher decision. After the workshop, I stopped in to Seed Savers Exchange’s Lillian Goldman Visitors Center and perused the rack of tomato-seed varieties, each with its own tantalizing history. The ‘Italian Heirloom’ tomato packets immediately caught my eye. Winner of Seed Savers Exchange’s 2012 Tomato Tasting Event, the 'Italian Heirloom' was touted as “extremely productive,” bearing bright red fruit that grows to more than a pound and boasts excellent “full-tomato” flavor. A productive, great-tasting, and award-winning tomato variety? I was sold! Next up: “Adventures of a first-time seed starter, part two”: What I did right (and wrong) with those ‘Italian Heirloom’ seeds once I brought them home.